"Sampath Speaking" - the thoughts of an Insurer from Thiruvallikkeni: teach the society that failures are part of life ~ have to be faced and overcome !! teach the society that failures are part of life ~ have to be faced and overcome !! A small village Panapakkam, 88 kilometres from Chennai is in news for wrong reasons and .. has raised lot of debate in social media. Headmistress Ramamani and teacher Meenakshi Sundareswari have been suspended and how do you view this ? History teaches lots of things .. .. read of Battle(s) of Panipat. 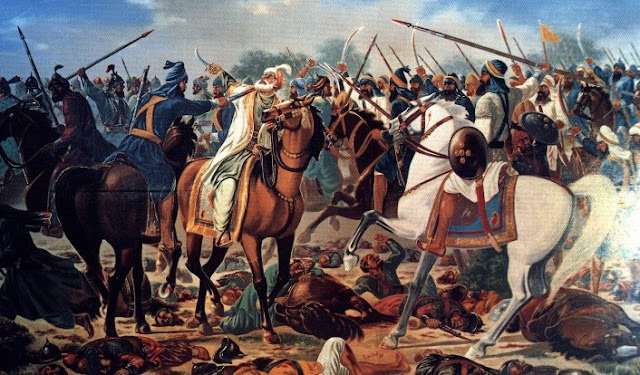 The Third Battle of Panipat took place on 14 January 1761 at Panipat, about 60 miles (97 km) north of Delhi, between a northern expeditionary force of the Maratha Empire and invading forces of the King of Afghanistan, Ahmad Shah Abdali, supported by two Indian allies—the Rohilla Afghans of the Doab, and Shuja-ud-Daula, the Nawab of Awadh. Militarily, the battle pitted the artillery and cavalry of the Marathas against the heavy cavalry and mounted artillery (zamburak and jezail) of the Afghans and Rohillas. The battle is considered one of the largest and most eventful fought in the 18th century. Centuries after the war, some analysts point out that it was not only the geography, logistics, changing times, attitude, getting more alienated, military acumen and strategy, facing new type of ammunition and armoury – all contributed to the defeat of Maratha Empire, which perhaps failed to read from its victories over a longer period of time. Wars are cruel and are acid test of the economic, social, technological and moral strength of a nation. The momentous war of Panipat was to have its everlasting impression on the future of the Nation. The battle of Panipat was a turning point in the history of not only Marathas but whole of India. A British historian writing about this battle has opined that but for this defeat' whole of India would have been 'Marathaised'. Panipat was the first major battle that Marathas fought with reliance on artillery and fire-arms based infantry. The Marathas fought at Panipat for a national cause. Their failure to defend India left a deep psychological impact on them. No commentary on history – but pure fact that there will be failures and one should learn to cope up with failures rather than giving up. And many a times with the social media, print and visual media, failures are handled differently, sometimes failures are glorified while sometimes, people are driven to despair and to failure ! At International Court of Justice there was to be great drama. Slobodan Praljak was one of six former Bosnian Croat political and military leaders up before the court. He was sentenced to 20 years' imprisonment in 2013 for crimes in the city of Mostar. On hearing that his sentence had been upheld, he told the judge, "I have taken poison". The six were appearing in court for the final appeals judgment to be handed down by the Yugoslav Tribunal. One-time allies against the Bosnian Serbs, Bosnian Croats and Muslims fought each other during the civil war from 1993-94, with Mostar seeing some of the fiercest fighting. Praljak stood and raised his hand to his mouth, tipped his head back and appeared to swallow a glass of liquid. Presiding judge Carmel Agius immediately suspended the proceedings and an ambulance was called. "Okay," the judge said. "We suspend the... We suspend... Please, the curtains. Don't take away the glass that he used when he drank something." Before the curtains were lowered, the courtroom could be seen in a state of confusion, the BBC reports from The Hague. Back home, inn Tamil nadu, the death of 4 students has anguished people. Four school students reportedly committed suicide by jumping into a well near Avalur on Friday afternoon. According to police, the students – all aged 16 years and studying in class XI at a government school in Panapakkam – jumped into a well in Ramapuram in Avalur. They were identified as Manisha, Sankari, Deepa and Revathi, all residents of Panapakkam. Preliminary inquiry revealed that their teacher had asked them to bring their parents to school as they did not do well in academics. “It looks like they took the extreme step out of fear,” a police officer said. The incident came to light after residents of the locality grew suspicious on finding two bicycles used by the students, their bags containing books and footwear near the well. The police were informed at 4 p.m.
Now that the Headmaster and the class teacher have been suspended –they would for sure face lot of hardship and turmoil. But merely reading the various reports, does it not appear that the Teacher and HM did only what was expected of them. It appears that they did not publicly shame the girl students but only asked that the parents of those girls be present in the school. Is that anything wrong ? – should teachers be questioned for everything. No other opinion that death of students is sad – irreparable loss for the students. But over the years, education and the hostile attitude to teachers have put them under fear all the time. Already there are talks that not many now a days come forward to teaching profession – and if teachers undergo mental pressure, what will happen in future ? 3 or 4 decades ago, teaching profession was most respected. The teachers had every right to cane, hit and punish the students. Parents would always support the teachers, requesting them to be strict and mend their children. Things have changed for worse !! The deaths of the girl students is sad and cruel - a step in addressing this should in making them and all the students understand that one should not despair at failure and should face difficulties and failures in life. Failure could be a reality in life and at some level understanding and embracing such failures would help one to grow. History for sure would reveal that great men had experienced colossal failures but got up in time to face the next round ! One can hate failure, but if it strikes, without allowing to dictate the future, should curtail emotions and seek to face the consequences. People should be taught to separate failure from one’s identity. As they say, it it not the person who has failed but one particular plot that has failed. Rather than getting angry, frustrated, emotional, blameful, vengeful, one should try to understand the reasons and seek to overcome it. From Thomas Alwa Edison to modern day inventors, all have experienced failure and humility repeatedly but rose up to become to be remembered as inventors rather than those who failed at simple steps. In a society, most of us look to the approval stamp of others without realising that they had not courted success. Michael Jordan said it best: "I have missed more than 9,000 shots in my career. I have lost almost 300 games. On 26 occasions I have been entrusted to take the game winning shot, and I missed. I have failed over and over and over again in my life. And that is why I succeed." It is time we taught the kids that failures are part of life and one should face it with courage and not punish those teachers and others blaming them to be responsible for the failure.